During the tumultuous reign of Nero, Vinicius, a pagan, and Lygia, a Christian, fall in love. Amazon.com description: Product Description: Rome during the reign of Nero was a glorious place for the emperor and his court; there were grand feasts, tournaments for poets, and exciting games and circuses filling the days and nights. The pageantry and pretentious displays of excess were sufficient to cloy the senses of participants as well as to offend the sensitive. Petronius, a generous and noble Roman, a man of the world much in favor at the court of Nero, is intrigued by a strange tale related by his nephew Marcus Vinitius of his encounter with a mysterious young woman called Ligia with whom Vinitius falls madly in love. Ligia, a captured King's daughter and a one-time hostage of Rome, is now a foster child of a noble Roman household. She is also a Christian. The setting of the narrative was prepared with utmost care. Henryk Sienkiewicz visited the Roman settings many times and was thoroughly educated in the historical background. 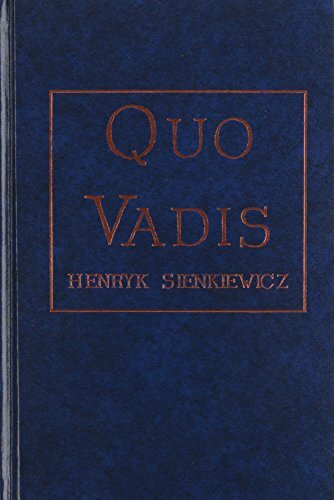 As an attempt to create the spirit of antiquity, the novel met with unanimous acclaim, which earned the Nobel Prize in literature for the author in 1905. As a vision of ancient Rome and early Christianity it has not yet been surpassed, almost a century later.